bus, originally uploaded by Lazy Seamstress. Please look away now if you are of a delicate disposition when it comes to hacking up vintage clothing. 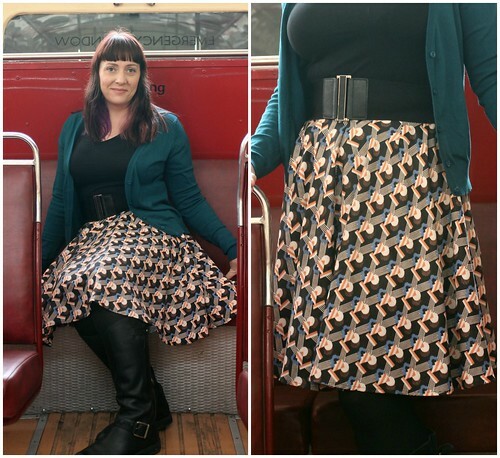 I found this skirt in Oxfam in Hockley, Nottingham a month or so ago. I spotted it immediately on entering the shop, the gorgeous Art Deco style print catching my eye. 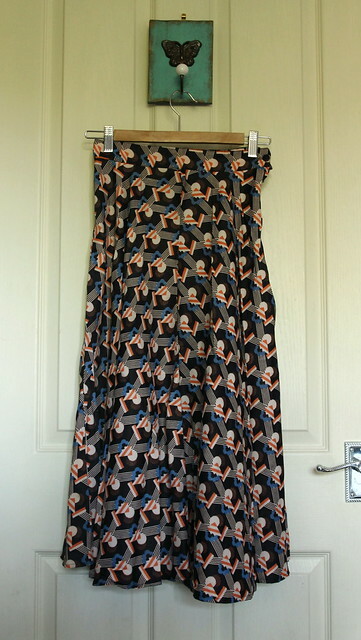 On closer inspection I found the skirt was a rather nasty acetate fabric, but the print so gorgeous I couldn't leave it hanging on the rack. The skirt probably dates from the 1970's judging by the nasty synthetic fibres and the maxi style. The waist was absolutely teeny tiny at only 22", but there was so much fabric in the skirt I knew I could easily get another skirt out of it that would fit me. I started by chopping the skirt off just below the zip fastening to see how much fabric I had to play with...rather a lot as it happened. I then cut off all the previously sewn seams. I evened up each panel, 4 in total. I then stitched up three seams and added an invisible zip to the fourth before completing that seam. I tried it on, and it was a little large for me, so since I didn't want to lose any of the fullness in the skirt length, I added four waist darts . I then finished the waist with bias binding and a hook and eye fastening. I had kept the original hem in place on each panel and simply ensured they matched up when I stitched each seam. 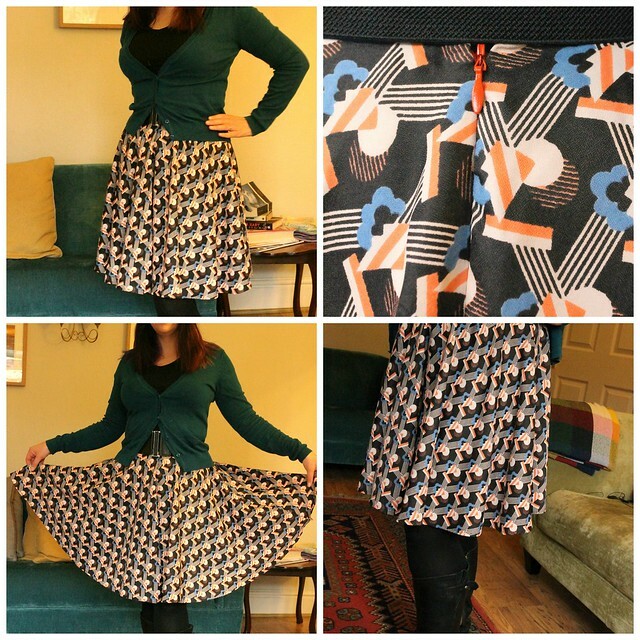 The result is a lovely circle skirt, and I'm really pleased with it. it's gorgeous and really suits you. Love it. Lovely the art deco design is just gorgeous. Benedict took a peek at the pictures and said, "Is that a bus she's in?!" Lovely fabric and the skirt really suits you.